Jon Daly insists playing at their home ground does not give Rangers an edge in Saturday's Scottish Cup semi-final against Dundee United. The last-four showdown is being played at Ibrox as Hampden is unavailable due to the Commonwealth Games and United had raised complaints about the venue. "A lot of people have said there's an advantage for Rangers, but I don't see that," said Rangers striker Daly. "It's a one-off game, so I don't think the venue really matters." 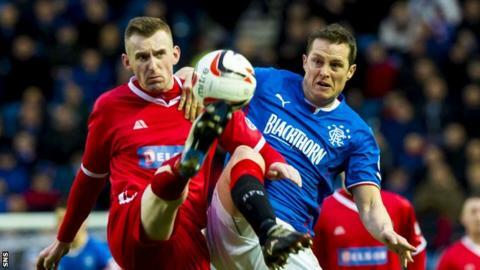 Rangers have sold more than 20,000 tickets for the match, with United having breached the 10,000 mark so far. "It's a grass pitch and there are going to be 22 players, so that's all that's important," former Tangerines striker Daly told Rangers' website. "Of course, it'll be good to have our supporters there and hopefully they'll get right behind us, but United will have their fans at the match too. "When you're on the park, you don't really concentrate on what's happening off it too much. "There's a big prize at stake and that's what everyone will focus on." Ally McCoist's League Two champions lost 1-0 to Raith Rovers in the Ramsdens Cup final on Sunday and will go into Saturday's game as underdogs. But, despite the fact United have knocked Rangers out of the Scottish Cup three times in the last four years, Daly believes the tie is in the balance. "I don't think the lads will see themselves as underdogs," he said. "And I don't think United will look at themselves as the favourites. "It's going to be one of those games where you have two good sides having a go at each other and trying to get to a cup final. "We believe we've a really good pool of players that can do well and I'm sure the manager believes that too. "It's hard to judge where we are because we're not playing Premiership teams every week and this will be a different type of game to what we've been used to this year. "But hopefully we can rise to the challenge and get through to the final, which would be fantastic for us all."